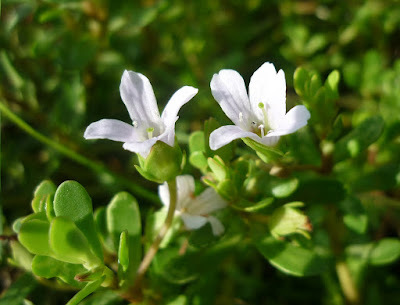 Brahmi (Bacopa Monnieri) other names: Andri, Bacopa, Bacopa monniera, Bacopa monnieri, Herb of Grace, Herpestis Herb, Herpestis monniera, Hysope d’Eau, Indian Pennywort, Jalanimba, Jal-Brahmi, Jalnaveri, Nira-Brahmi, Moniera cuneifolia, Sambrani Chettu, Thyme-Leave Gratiola, Water Hyssop. The semi-aquatic plant called the brahmi is found growing in India, as well as in the tropical marshes and wetlands along Florida, brahmi is also found in parts of Central America and other tropical regions of the world. 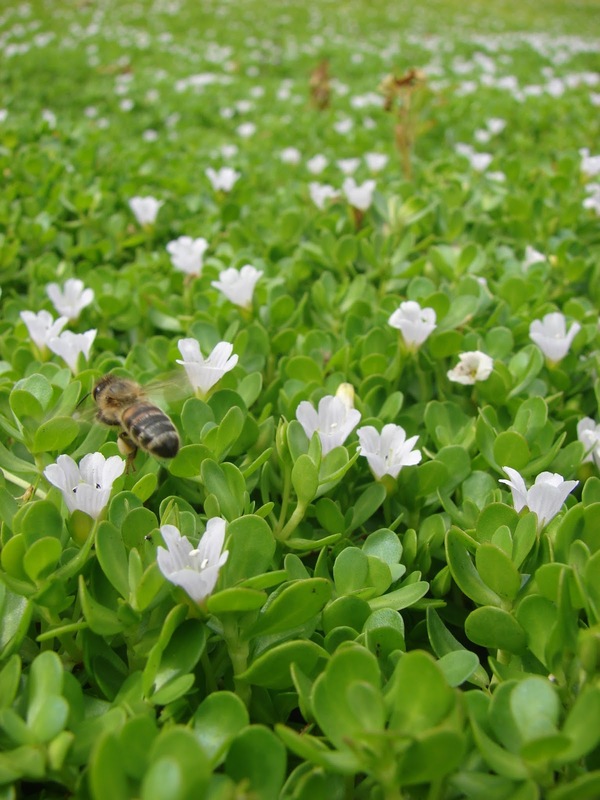 The plant is an aquatic creeping perennial herb, marked off by crinkled leaves and distinctive white flowers; it is related to the plant family containing plants like the spinach and the snapdragon. The herb is found floating in the waters of marshes and wetlands in tropical regions of the world. Herbalist make used of the tops of the plant to prepare herbal remedies of many kinds for the treatment of all types of problems and disorders. The brahmi is considered to be an important herb in the ancient Indian ayurvedic system of medicine, in fact, the brahmi is said to be similar in its medicinal properties to another herb called the gotu kola and the remedies made from both plants are used in similar fashion and to treat related symptoms worldwide. Brahmi has an established reputation as an effective and powerful brain and nerve tonic, among all the Indian ayurvedic herbal therapies used to this end. Cells in the brains and the nerves are restored and revitalized by this herb and thus is acts in restoring nervous function. Traditional has given a reputed name to the effectiveness of this herb, and the brahmi is believed to be very effective in improving the circulation of blood in the brain, it is believed to help in increasing a person's intelligence, it is believed to be endow longevity to a person, and said to promote both the short term as well as long term memory of people, last but not least the herbal remedy is said to be capable of staling the symptoms of physical aging and is believed to reduce senility in older individuals. The herb is used extensively by many practitioners of traditional ayurveda in treating all sorts of disorders, the brahmi has been used to treat fevers in patients, it is used in the treatment of inflammation on the body, it is used in the treatment of pain in the joint, and it is extensively made use of in treating a number of skin problems, it is also a good detoxification agent and is used as a blood cleansing herb in the traditional medicine of India. The growth of hair is believed to be stimulated by the brahmi, and the herb is believed to induce growth of skin and nails in individuals as well. A number of disorders related to the deterioration of brain functioning is treatable using the brahmi, these includes the well known Alzheimer's disease, the nervous disorder called ADD - attention deficit disorder, different types of memory problems, and disorders such as Parkinson's disease - all of these are disorders connected to some impairment in the mental capacity of the individual. All such problems involving reduced mental capacity are treatable to some extent using the brahmi as an herbal remedy. Brahmi also acts on the regions of the brain involved with long term memory, where the two active compounds found in the brahmi called the bacosides A and B, are responsible for bringing about an increase in the activity of protein kinase and the synthesis of new protein molecules. 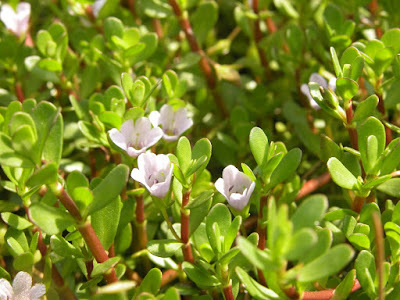 The brahmi has been attributed in many laboratory studies as inducing faster mental performance times, it is also believed to reduces the rate of neural errors, and benefits the brain by considerably improving the capacity to acquire and retain learned behaviors. Brahmi is also said to help increase the adaptability of the brain for new learning and essentially helps in reducing forgetfulness or the temporary loss of memory which often affects many individuals around the world. A disrupted circulation in the brain is believed to be one of the major causative factors for attention deficit disorder or ADD, the brahmi is believed to help in reducing the synthesis of inflammatory chemicals inside the brain which tend to that interfere with the circulation, thus it restores normal circulation and helps the person overcome the disorder. Normal physical activities are not affected by the brahmi's well known calming effect on the body - for this reason, the herbal remedy has become the best medication for the treatment of children affected by attention deficit hyperactivity disorder or ADHD in short. The toxic effects of free radicals are also warded off by the brahmi, this herb has an antioxidant ability and aids in beating back and neutralizing all the free radicals inside the brain, the linings of the brain cells are protected by the brain and this action prevents long term damage to the nervous tissues making up the brain. The brahmi is excellent and effective in the treatment of anxiety disorder and stress affecting an individual. As it has been already mentioned, calm and peace of mind is induced by taking the brahmi based remedies. Restlessness and mental distractions caused by nervousness are easily reduced and defeated by taking the brahmi. Ideally, people who spend a lot of time in very stressful work or study environments can take the brahmi, not only for its calming effects but also due to its unique property of bringing about an improvement in the cognitive functioning of the brain. Disorders such as the irritable bowel syndrome can also be treated using the brahmi as an herbal remedy. The brahmi has beneficial effects for the treatment of irritable bowel syndrome, this property of the herb was confirmed by a study that evaluated brahmi in the treatment of irritable bowel syndrome and compared it to the action of other herbs, the brahmi is a good treatment option particularly in those cases where the main symptom of the condition is a persistent diarrhea that affects patients for days on end. A few side effects can be induced by the brahmi, the herbal remedy can cause temporary hearing loss in women, especially those who are affected by problems of excess production of estrogen in the body or even those women under estrogen replacement therapy and those on regular courses of contraceptives. Temporary hearing loss in such women may result by an interaction between the hormone estrogen and the increased levels of GABA brought on by the brahmi supplement. Brahmi extract is possibly safe for adults when taken by mouth appropriately and short-term, up to 12 weeks. Common side effects include increased bowel movements, stomach cramps, nausea, dry mouth, and fatigue. Pregnancy and breast-feeding: There is not enough reliable information about the safety of taking brahmi if you are pregnant or breast-feeding. Stay on the safe side and avoid use. Slow heart rate (bradycardia): Brahmi might slow down the heart beat. This could be a problem in people who already have a slow heart rate. Gastrointestinal tract blockage: Brahmi might cause “congestion” in the intestines. This might cause problems in people who have a blockage in their intestines. Ulcers: Brahmi might increase secretions in the stomach and intestines. There is concern that this could worsen ulcers. Lung conditions: Brahmi might increase fluid secretions in the lung. There is concern that this could worsen lung conditions such as asthma or emphysema. Thyroid disorders: Brahmi might increase levels of thyroid hormone. Brahmi should be used cautiously or avoided if you have a thyroid condition or take thyroid hormone medications. Urinary tract obstruction: Brahmi might increase secretions in the urinary tract. There is concern that this could worsen urinary obstruction.